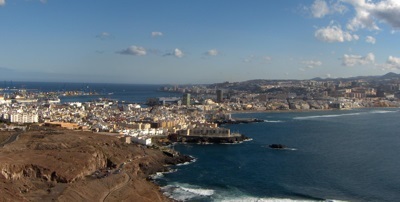 Las Palmas de Gran Canaria is the capital city of Gran Canaria, capital of the province of Las Palmas, and co-capital of the autonomous community of the Canary Islands, which is of course part of Spain. As of 2006, the city's population was 377,056, making it the largest city in the Canary Islands, and the eighth largst city in Spain over all. This guide is connected to Google Maps and suitable for all smartphones and tablets - with activated GPS. Looking for an easy-to-use, pocket city map that you can carry around with you, wherever you go without having to juggle with foldable maps that quickly turn into a complete mess? The Glob:us city maps is all you’ll need to have the whole city within arm’s reach: clear, black & white maps, at a comfortable scale, with all the points of interest included, plus a handy streets index, so that you’ll never miss a thing again. So, are you ready for your next adventure?